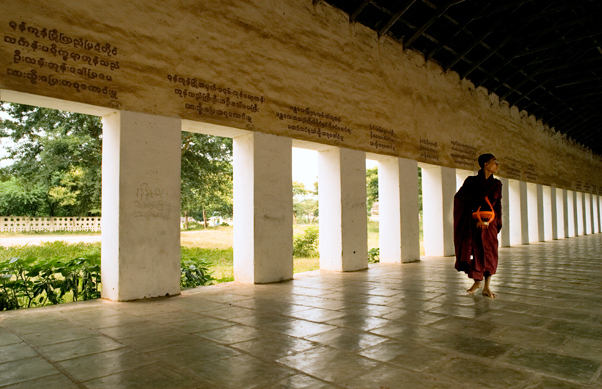 Luang Prabang is considered one of the three most interesting places to visit in South East Asia, the other two are Angkor Wat in Cambodia and Bagan in Myanmar. I did visit Luang Prabang during rain season and the river Mekong was mightier than ever. A shuttle bus picked me up at Casa Cristina in Antigua for one and a half hour journey to Panajachel. We traveled north on the main high way up into the Guatemalan highlands. 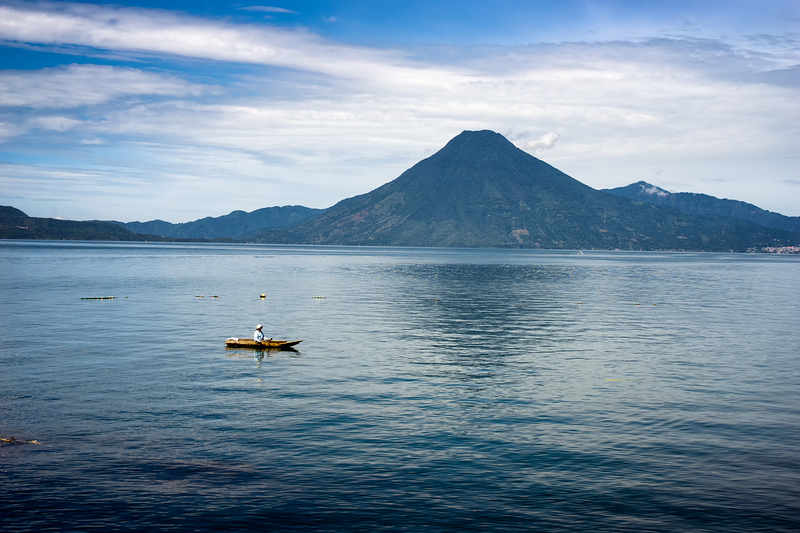 After one hour Sololá appeared on basin rim of the lake Atitlán. It was a foggy rainy day, so no view of the word famous lake at this time. 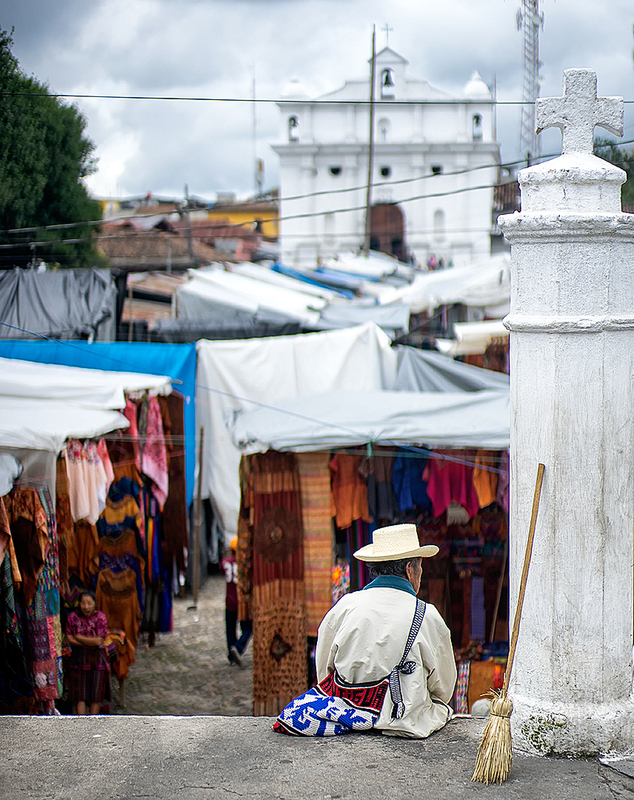 Sololá is a heavily populated town with a severe traffic jam. 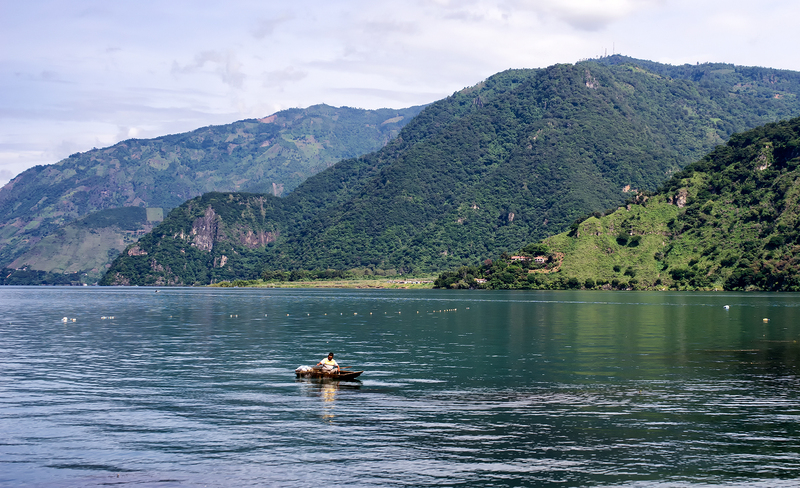 The steep descend down to Lake Atitlán starts immediately at the rim in Sololá. 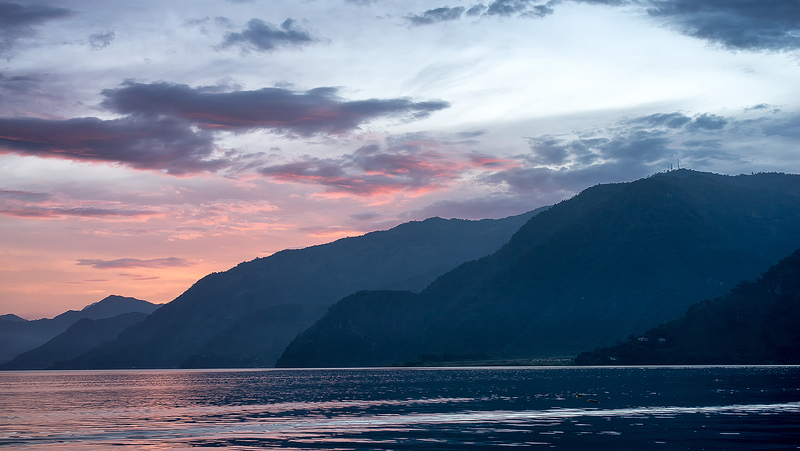 It´s a 600 meter drop down to Lake Atitlán from Sololá situated at 2114 meter. This is the deepest lake of Central America with 340 meter depth. Three volcanos are surrounding the lake creating an extraordinary landscape. 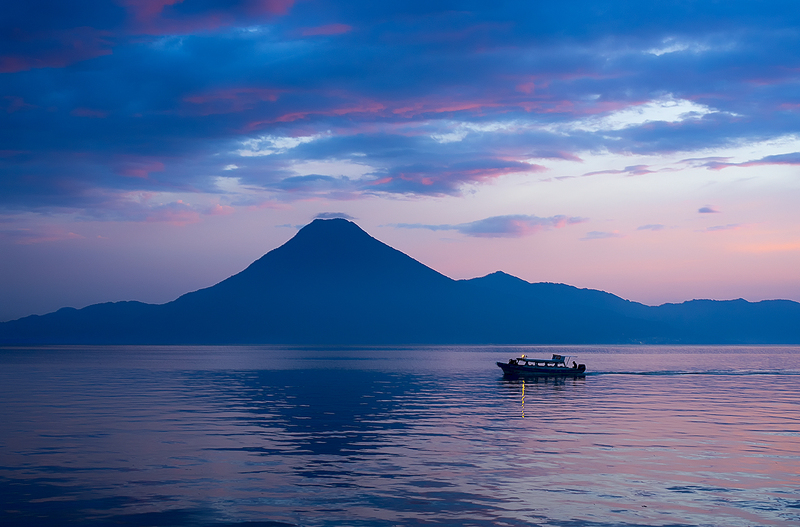 Lake Atitlán is dubbed by some the world most beautiful lake. In my point of view there are many other beautiful lakes around the world particularly in South America. After ten minutes driving on the serpentine road down to Panajachel the weather cleared up. It was time for the first nice view of the lake and a high waterfall on the other side of the road. 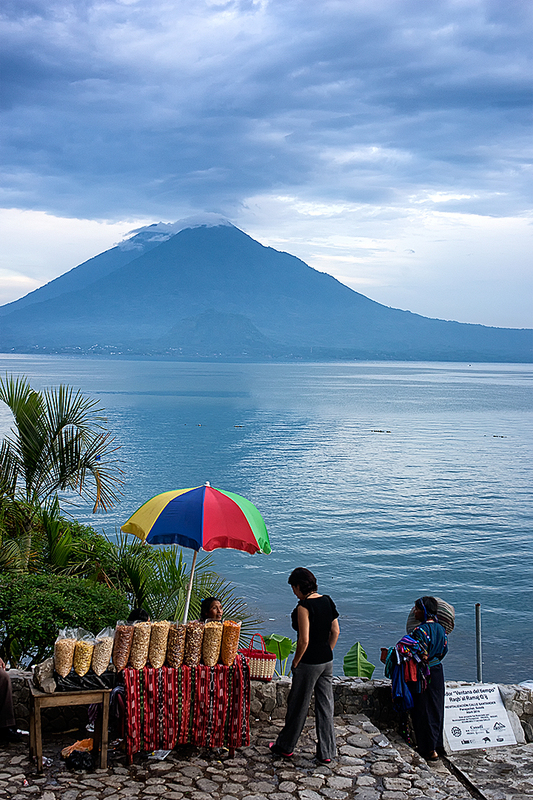 Panajachel is the main resort at Lake Atitlán and for many tourists the jumping off point to other villages around the lake. These villages are served by boats from Panajachel.
. The shuttle bus dropped me off at hotel Posada de los Volcanos. This is a nice hotel with very service minded staff. They served the best breakfast I had during my travelling in Guatemala. 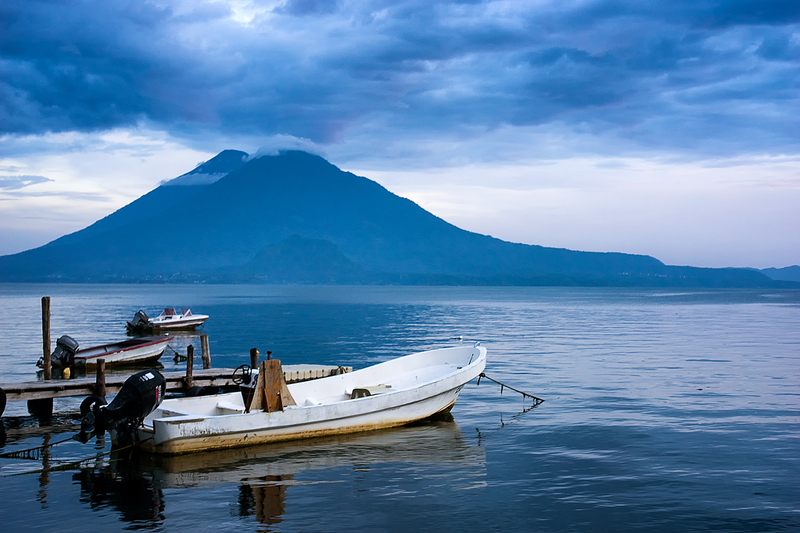 The hotel is located on the main street a couple of hundred meters from Lake Atitlán shore. If you have a room on the third floor as I had you will have a nice view over the lake. I booked a shuttle bus to the market in Chichicastenango and another shuttle bus back to Antigua through the reception desk at the hotel. Everything worked out very well. To my surprise Panajachel had a very nice Sushi bar located on one of the side streets closed to Posada de los Volcanes. I do recommend visiting this Sushi bar it had a wonderful garden with humming birds. It was far more than just a sushi bar it´s some sort of Japanese culture Centre. There girls come to learn Japanese dance. Of course they had delicious Sushi as well. 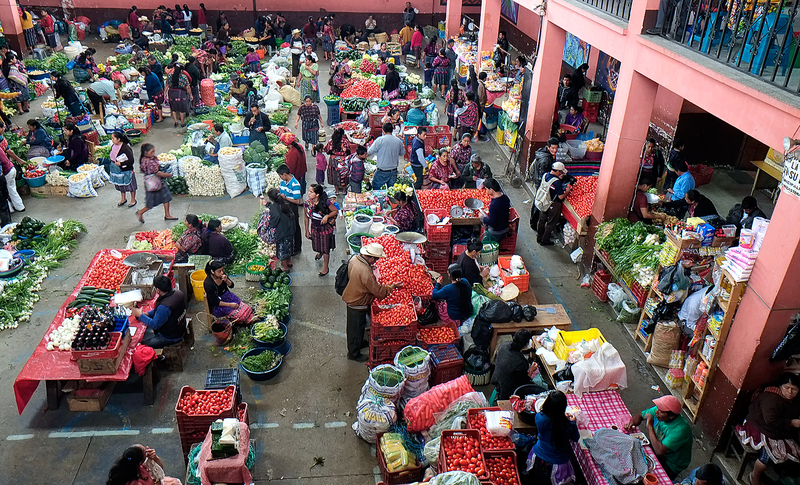 After an early breakfast at 07:00 in the morning it was time for the 40 km journey to the market day in Chichicastenango. The shuttle bus left Panajachel at 08:00 and arrived in Chichicastenango at about 09:00. 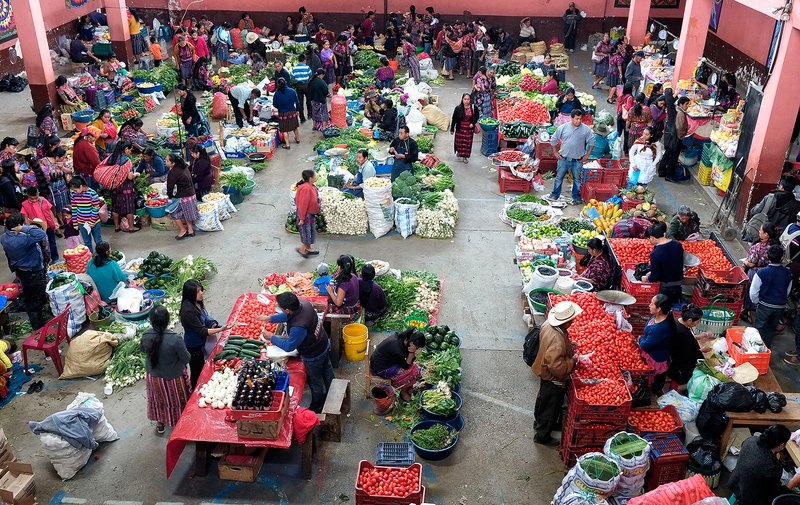 There are two market days in Chichicastenango one on Thursday and the other on Sunday. 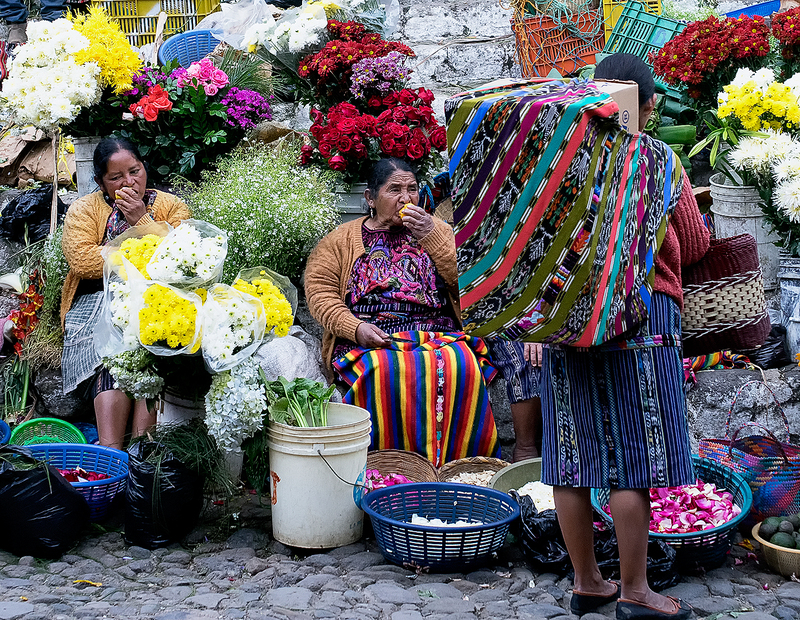 I do recommend going on Thursday since most of the Guatemalan people visits on the Sunday market day. 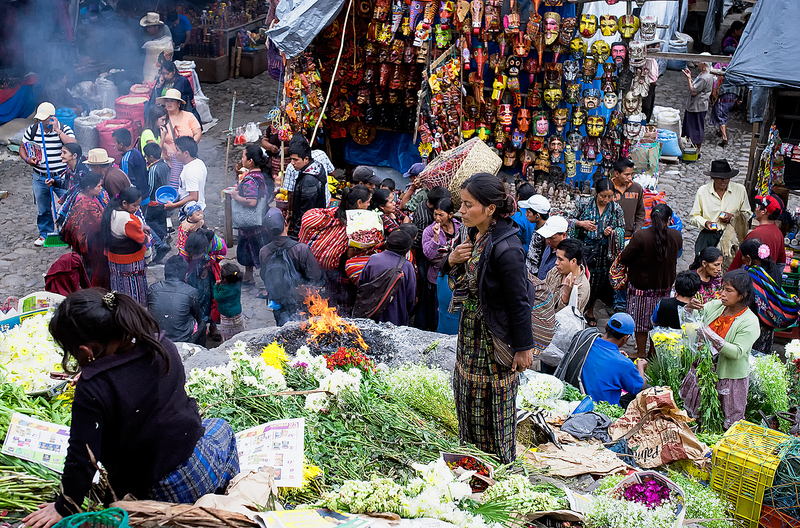 This is a world famous Indian market of Guatemalan highland and far more than just a market day. 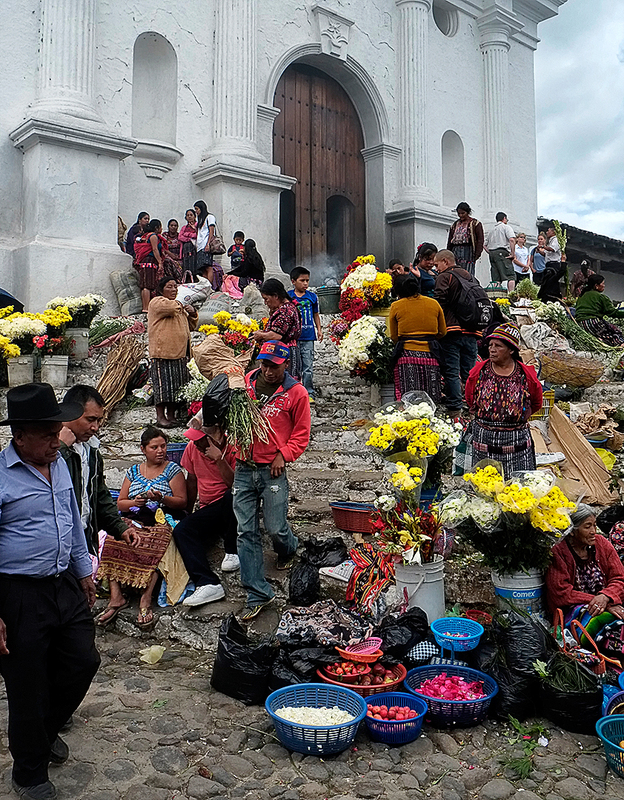 These market days are of strong religious importance to the local Indian tribes living in the highlands of Guatemala. On most of my pictures from Chichicastenango smoke will pour up almost everywhere. This is the Shaman priest doing their duty for the Indian tribes by burning incense. In particular this can be seen outside the four hundred old church San Tomás. © SWEBackpacker, 2012. Unauthorized use and/or duplication of this material including pictures without express and written permission from this blog’s author and/or owner is strictly prohibited. Excerpts and links may be used, provided that full and clear credit is given to SWEBackpacker with appropriate and specific direction to the original content. 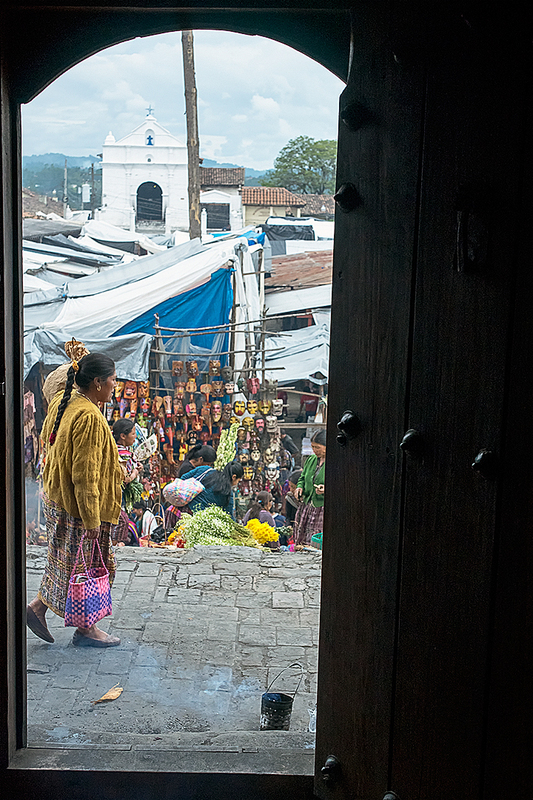 Antigua is the great colonial city of Guatemala. 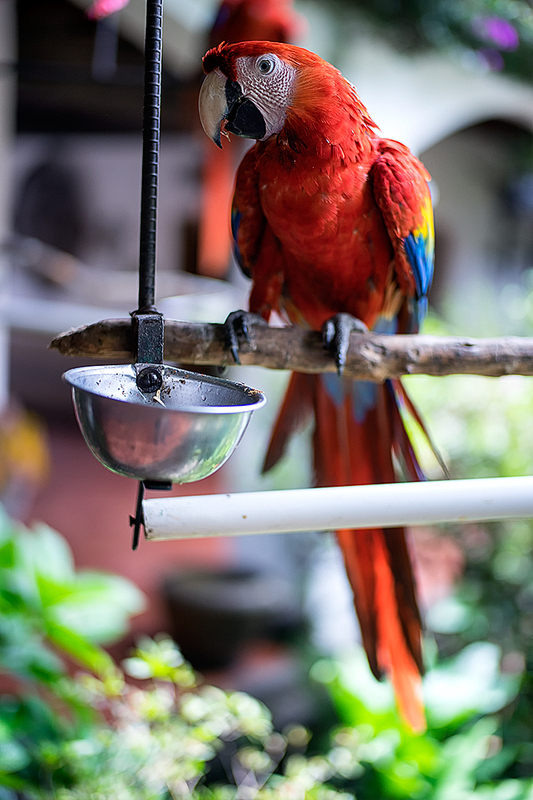 I left the beautiful and steamy hot Flores in El Petén for a night Journey to Guatemala City. It was a package with luxury bus to Guatemala City and Shuttle bus to Antigua next morning. After a day in above thirty degree Celsius and about eighty percent humidity it´s nice to enter a cool air-conditioned luxury bus. The journey started at 21:20 in the evening expected arrival time in Guatemala City about 06:30 in the morning. After a couple of hour the 17°C to 18° temperature is not so nice any more. It´s becoming very cool even for a Swedish man. 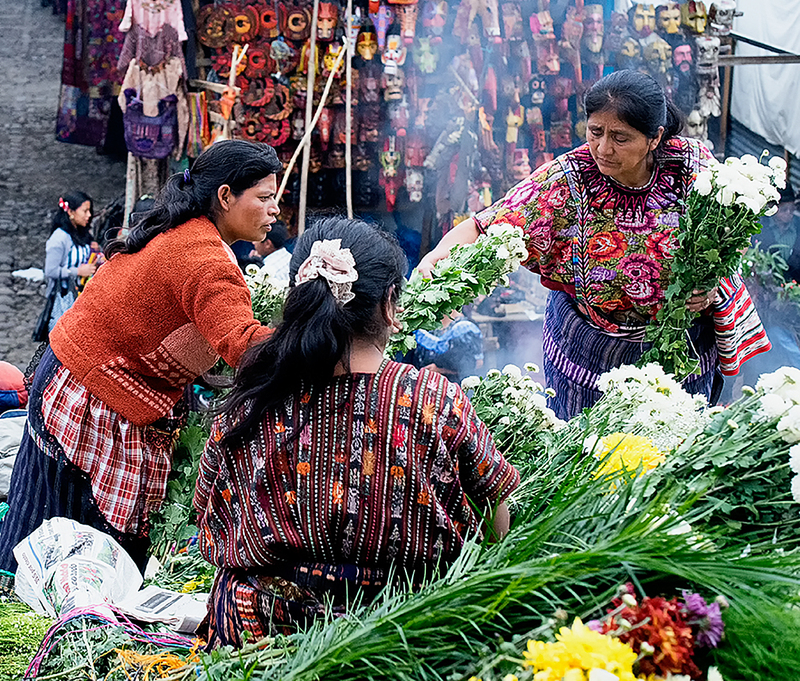 The Guatemalan people were well prepared for a cold journey with sweaters and blankets. My sweater was in my backpack in the luggage compartment. If going by long distance buses in Mexico or central America I recommend having a sweater handy and not in the backpack. Granada is mainland America’s oldest city. Granada is the right wing city of Nicaragua and Leon is the left wing city of Nicaragua. The political power moved between these two cities. When side got into power it sacked the other city and moved the power to their city. In the end Nicaraguans had had enough of this power struggles and created Managua between those two cities. There is still a lot to see in old colonial Granada funded 1524 although William Walker did his very best to sack the city 1856. Granada is located along the coast of Lake Cocibolca (known internationally as Lake Nicaragua) the world twentieth largest lake. From Managua it is a 47 km journey south to Granada. If you go by chicken bus it will cost one US Dollar for about one hour travel time. Expect to pay 40 US dollar for a hotel room with A/C, TV and hot and cold shower. Is Tulum to Caye Caulker in one day possible? It´s early morning in the end of June, I am in Mexico on the Yucatán peninsula, planning my travelling through Central America. Can I go from Tulum in Mexico to Caye Caulker in Belize in one day? There are two routes the first one is bus from Tulum to Belize City and water taxi to Caye Caulker. The second one is bus from Tulum to the city of Chetumal in Mexico and water taxi for one and a half hour to Caye Caulker. The only direct bus to Belize City left during the middle of night so the first route was not an option. Most tourists go to Havana, Trinidad or maybe Santiago de Cuba. Hidden in the middle of these three cities are Camagüey. This is Cuba’s third largest city on dusty plains in the middle of nowhere. Camagüey is a long way from Trinidad but even longer from Havana or Santiago de Cuba. For me it was an eight hour long bus ride from Santiago de Cuba arriving at the hotel in the middle of the night. Most people go to bed at that time but Camagüey fantastic photographic opportunities surprised me. It was darkness like a Charles Dickens city with colors, shades and reflections from the colonial buildings. I grab my camera and tripod for a several hour long stroll through the darky Camagüey. Cuban music seen from above. If interested in Cuban music one should go to Santiago de Cuba. This is the swinging city of Caribbean music particularly just before and during the carnival. Santiago de Cuba is a hotter more vibrant city than the more cool and relaxed Havana. Havana has the amazing old architecture while Santiago de Cuba has the fabulous music. The Patio de Artex is one of the wonderful music clubs along Calle Heredia on the way down to Parque Céspedes. On the square old men playing different instruments are trying to fork out some CUC: s from visiting tourists. A cross Parque Céspedes one can find Casa de Don Diego Velázquez museum. Even the museum has their performing musicians a couple of times a week. If you are staying in Madaba it´s possible to make a very nice round tour to different sites of Dead Sea area. This can be done by taxi or rental car. Drive south out of Madaba following the ancient King Highway to Libb. In Libb turn right to Mukhawir and continue for about 15 km until you come up on a high ridge with a splendid view over the Dead Sea and Herod’s the Great Palace of Machaerus ruin. This is the place there Salome danced her famous seductive dance for King Herod. Most people visiting the Dead Sea stay at expensive hotel resorts at the northern shore. In fact, there is an interesting budget alternative 30 km south in Wadi Mujib national park. Wadi Mujib is the Grand Canyon of Jordan, a fantastic area for walking, canyoning. I arrived in Santiago de Cuba five days before the Carnival in Santiago De Cuba. My Casa particular (Cuban bed and breakfast) was on Calle Heredia about five minutes walking down to Parque Céspedes. Santiago de Cuba was dressing up for the carnival. Hugo Chavez was coming to visit Raul Castro so it was necessary to paint the front side on all houses along the way the carnival cortège would follow from the start to the finish at Parque Céspedes. All over the city people were training dance steps, preparing dresses for the carnival. One could hear music in each street corner, actually the same music everywhere, Santiago de Cuba was like a gigantic orchestra playing these rhythms. I was a vibration as special feeling one ca only feel in eastern Cuba on the Caribbean side. Landmannalaugar about 30 km east of Hekla in the inner of Iceland is probably one Europe’s most extraordinary places. One can reach this wilderness area with a bus from Reykjavík. The journey takes five and a half hour and the bus ride starts at 8:30 in the morning. Buy the South Circle pass at Trex in the bus station in Reykjavík and include Vik in your schedule. There is a possibility to extend the journey to Skaftafjell as well. If you go see to what you have best possible tent, sleeping bag, backpack and walking boots. You will need a tent that can withstand a storm in the open landscape without any wind protections. One can expect surprisingly cold weather even in the middle of summer with snow and temperatures below zero degrees celsius. Bring a warm sleeping bag with you! Stock up on food in Reykjavík harbor area, if you decide to break the journey into Landmannalaugar, Sellfors is another good are to stock up on food. If you are unsure about the standard of your equipment rent a hut but book as far in advance as possible. Landmannalaugar is a fantastic walking country with several possibilities for a day walk. If you are self-sufficient and can carry all your gears, there is the extraordinary fifty-five kilometer walk down to Pórsmörk. I had left Holguin and travelled to Gibara on the north coast of Cuba. This is a tranquil sleepy small fishing village which spreads from a calm sparkling bay into the rugged surrounding hills. A nice area to calm down for a few days. The spot there Christopher Columbus first disembark in Cuba on October 28, 1492 is twenty km to the east of Gibara in Play Don Lino. I strolled around in Gibara then I come across a car rental company Cuba-Car. It was next to impossible to rent a car in Holguin so I didn´t have much hope in renting a car in Gibara. The man responsable for the office Raymond said, this office is for Cubans living abroad coming back home on vacation. If they need a car they can rent one. I said what about tourists can they rent a car? In the late afternoon I arrive in Holguin Cuba’s fourth largest city (195 000) after a long bus ride from Trinidad. There is actually no good reason for a tourist to stay in Holguin this is an industrial city. The old colonial city of Camagüey Cuba’s third largest city (270 0000) west of Holguin is far more interesting and rewarding for tourists. A taxi drove to Casa Particulares Casa de Rosa near the central areas of the town. This casa was spotlessly clean and had hot-water bathroom. In the evening I went out to see what Holguin could offer for entertainment in the middle of the week. I met Ramon Quintana on Plaza Calista Garcia.